Brown the bacon in a medium skillet and toast the English Muffins, cut sides up, on a baking sheet under the broiler. Fill a 10-inch nonstick skillet half full of water. Add white vinegar to the cooking water. This will make the egg white cook faster so it does not spread. Bring to a slow boil. Gently break 1 of the eggs into the water taking care not to break it. Repeat with remaining eggs. Reduce the heat to a gentle simmer. Cook 3 1/2 minutes until the egg white is set and yolk remains soft. Remove with a slotted spoon, allowing the egg to drain. To assemble: lay a slice of Canadian bacon on top of each muffin half, followed by a poached egg. Season with salt and pepper. Spoon hollandaise sauce over the eggs. Garnish with chopped parsley. 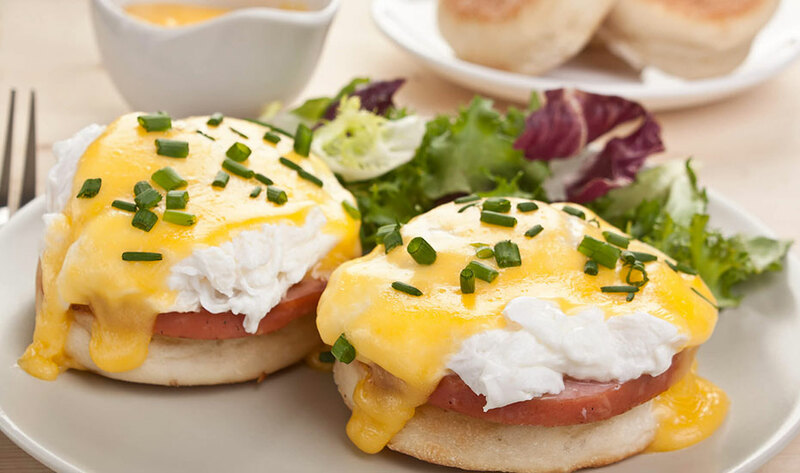 Check out our fail-proof recipe for Hollandaise Sauce, here.